My most favorite recipe out of ladies finger is this masala. 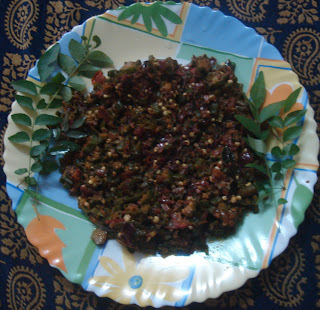 The main reason is that ,I can give it as a side dish or a spread or a mix which can be mixed with rice. Ladies finger fry for sure will be tastier but it can serve only a single purpose as a side dish. Now a days we search for recipes of this sort only and so this will be very useful for youngsters especially bachelors. The procedure is more important than ingredients. Keep the kadai in the stove. In 1 table spoon of oil season the curry with items given for seasoning. Now add the onions and sauté well. After the onions get sauted, add the tomatoes and sauté for 2 to 3 minutes. Add the sambar powder, turmeric powder and the salt needed and mix well. 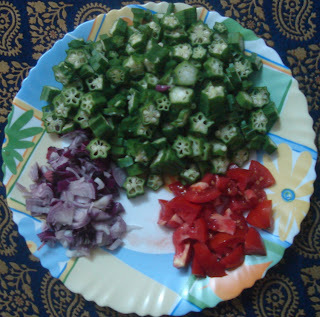 When there is not much of water content (water from tomato ) add the cut ladies finger pieces. Keep the stove in medium fire. When you feel that the ladies finger has reduced in qty add the curd and mix well. Cook for 5 minutes stirring regularly. Now sprinkle 2 table spoons of water and mix well. Cook for another 3 to 4 minutes. Check for the taste now. Again add 2 table spoons of water and mix well. Now you will find that your curry is like a masala. Keep in mind that the flame should be in medium all the time else the curry will get burnt. Wishing You a Happy Easter! Healthy Split Pea Curry Fat Free!